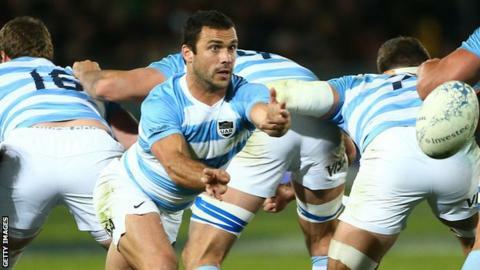 Harlequins have agreed a deal to sign Argentina internationals Santiago Garcia Botta and Martin Landajo from Super Rugby side Jaguares. Prop Garcia Botta, 26, and scrum-half Landajo, 30, will join Quins following the World Cup in Japan, if they are selected in the Pumas squad. "Martin will add greater density to our leadership group," Quins head of rugby Paul Gustard told the club website. "Santi is a powerful prop who has had an excellent career in Argentina." Harlequins have not disclosed the length of the pair's contracts at the Twickenham Stoop. The World Cup will take place from 20 September to 2 November, with Argentina in the same group as England, France, the United States and Tonga.